A dramatic breakfast full of history and wine. 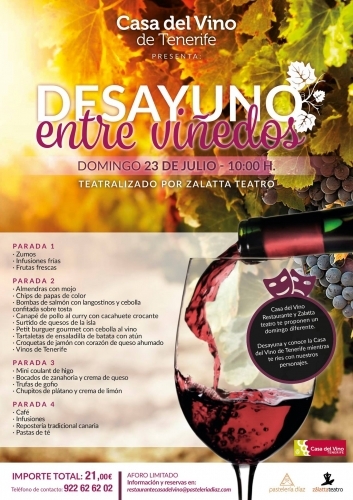 The House of Wine in the north of the island is hosting a special 'Desayuno entre Viñedos Teatralizado'; giving visitors the chance to ry the best wines of the island whilst hearing stories from the past from the Zálatta theatre group. The price is 21 Euros each. For mre information or to reserve your place call 922 626 202 or 922 531 01. Email is teneriferural@teneriferural.org.